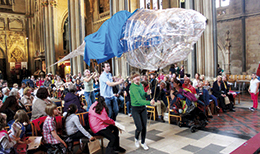 Thank you to all who helped to make our Holy Week and Easter services and events so successful. Congratulations to baby Susie who was baptized this morning. 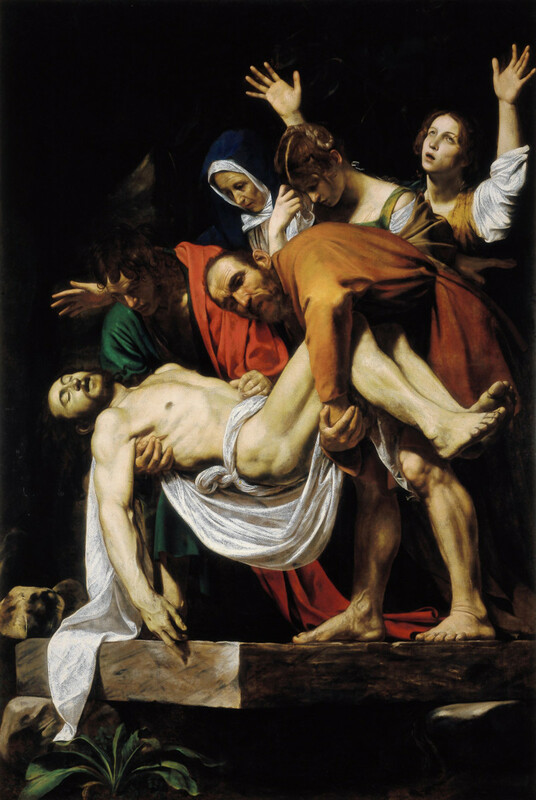 Sermons for Maundy Thursday, Good Friday and Easter Sunday can all be found on the sermon blog here. 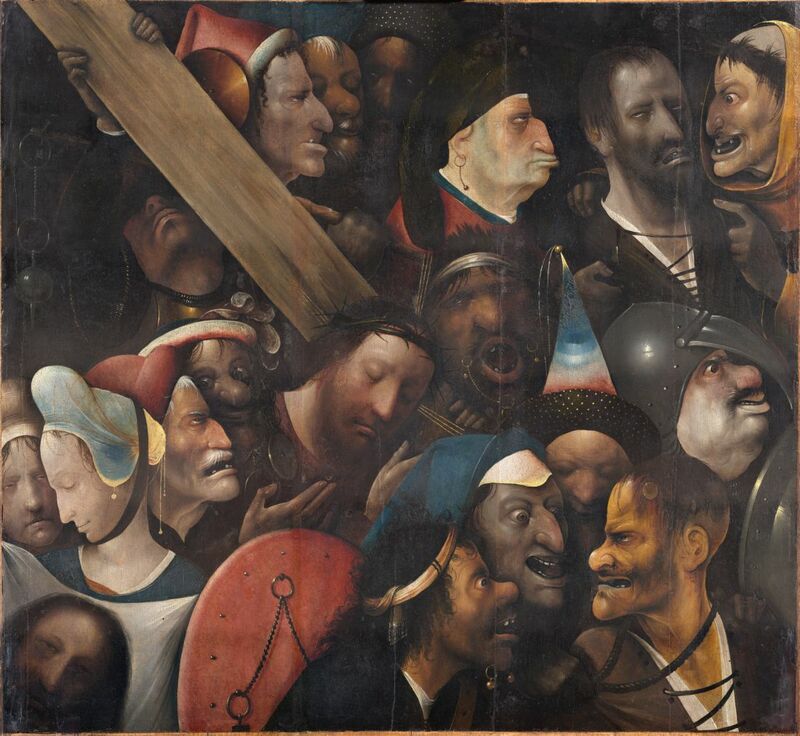 This is the last of the Lenten blog posts. I hope you have found them helpful. If you have questions on any of the types of prayer we have tried during Lent, please let me know. If you have suggestions on future blog post series, I would love to hear them. Prayer in the Christian Tradition is not something we simply do alone. We are also called to pray together, because the fundamental commandment of Jesus is that we should love one another, and we can't do that if we never gather together. We may not always agree with each other, or get along, but we are still members of one family. Rather than posting suggestions for individual prayer through this week, I would like to invite you to find others to pray with, either at Seal or elsewhere this week. There are services on every day through Holy Week in Seal Church. 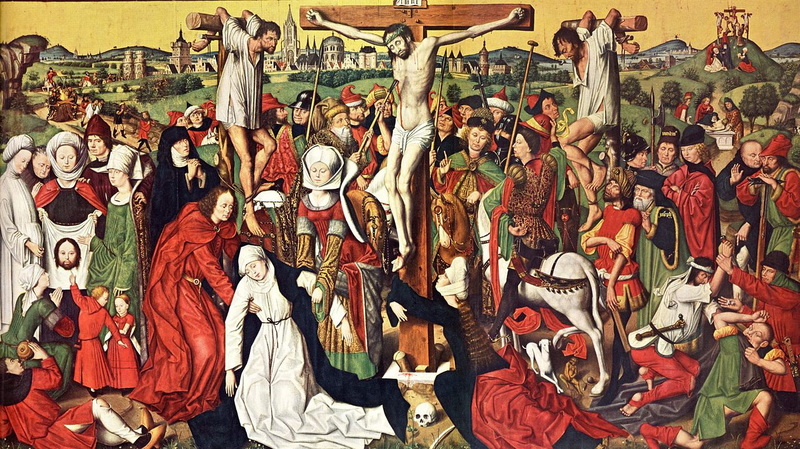 On Holy Saturday there will be Compline at 8pm. On Easter Sunday we will celebrate the Resurrection with a joyful service of holy Communion and a Baptism too. 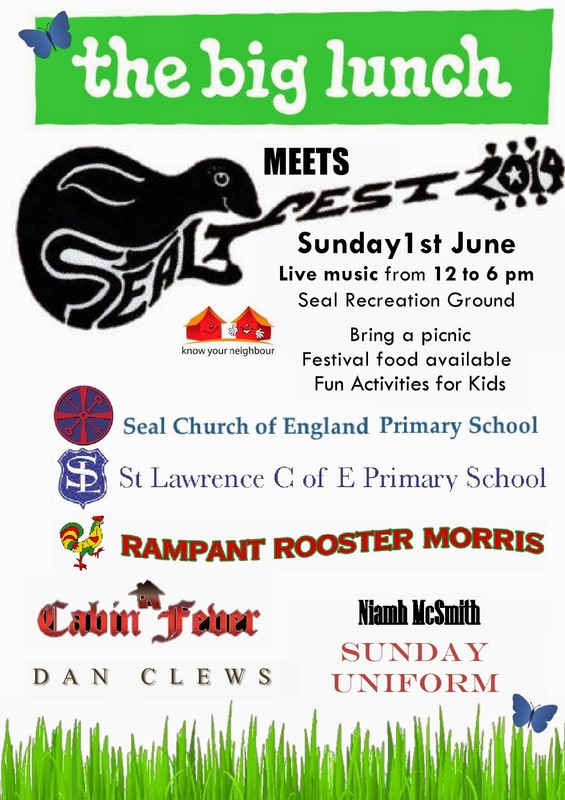 Come along and join in these acts of liturgical prayer, or, if you aren't in Seal, find a church near you to gather with others to pray. If you can't get to services, be aware that others both locally and around the world are praying along with you, even if you can't see them and they can't see you. In order to help you journey through this week, I will post the readings for our services at Seal each day, so you can read them for yourself beforehand. You could use any of the techniques we have explored through Lent to help you contemplate them. You can substitute the readings we will be using at our services during Holy Week at Seal if you would like to. On Good Friday afternoon at Seal I put up a number of reflective displays for people to come and look at in their own time. 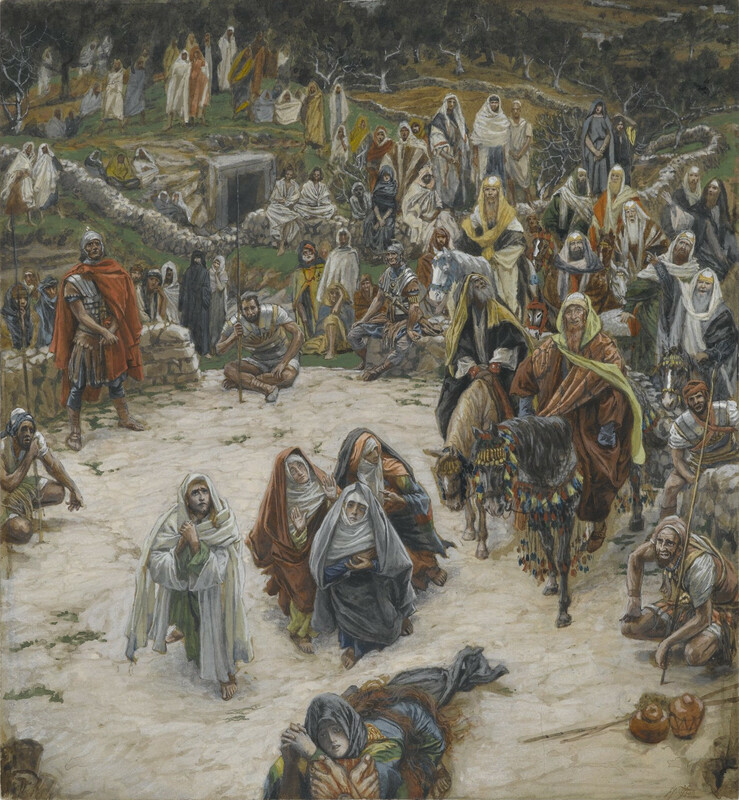 They usually remain in church for at least a week after Easter Sunday, so if you haven't had a chance to see them today, you can pop into church on any day to spend some time looking at them. The display asks us to think about whether we sometimes try to squash the new opportunities and new life that are offered to us. We can sometimes be "guarded" in our welcome for them too, and try to stop anything from changing, even if it would be for the better. The donkey Jesus rode on on Palm Sunday can't have ever imagined that this would ever happen to him. At Messy Church we made donkeys out of cardboard and jiffy bags (like hobby horses) The children enjoyed riding them around the church! The display asks us to think about times when we might have felt silly or thought no one would ever choose us. 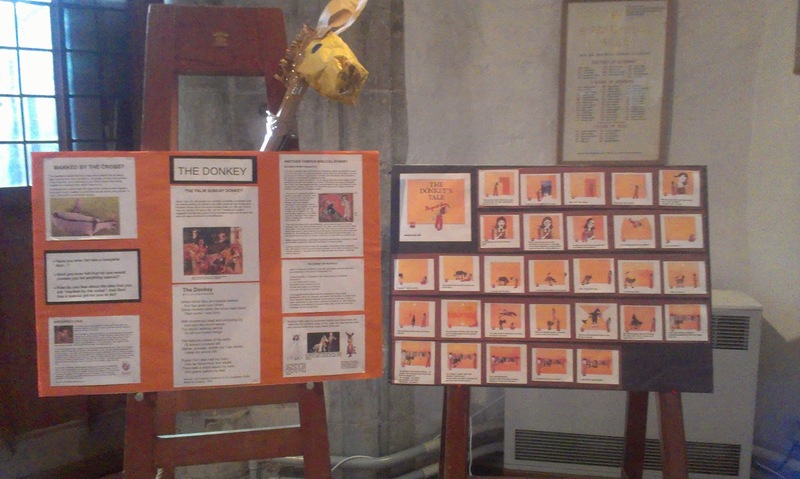 There is also a reproduction of "The Donkey's Tale" by Margaret Gray - you can read it here. How do you feel about your feet? On Maundy Thursday we heard the story of Jesus washing the disciples's feet, despite their protestations that this wasn't his job at all. This display asks us to think about our feet. How do they feel, and how do we feel about them? 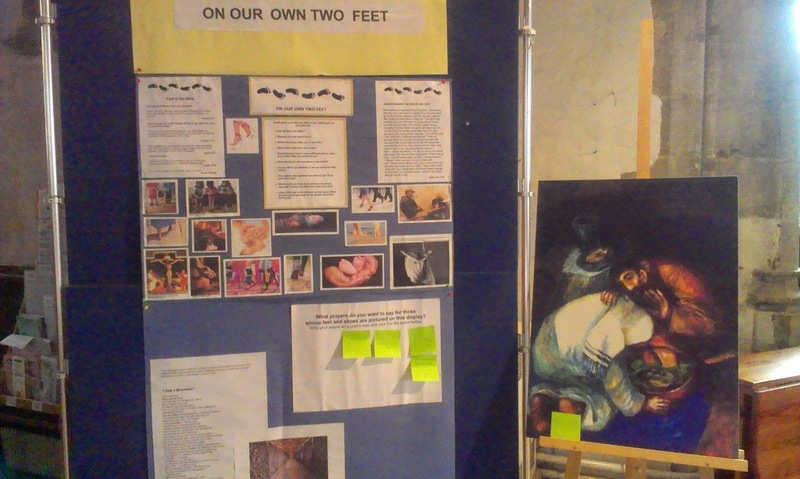 How would we have reacted if Jesus had wanted to wash them The display has pictures of many different feet, and invites us to consider what prayer we might say for those whose feet they are. It also has this poem by Moses Schulstein about the mountain of shoes at the German Nazi concentration camp of Majdanek in occupied Poland. 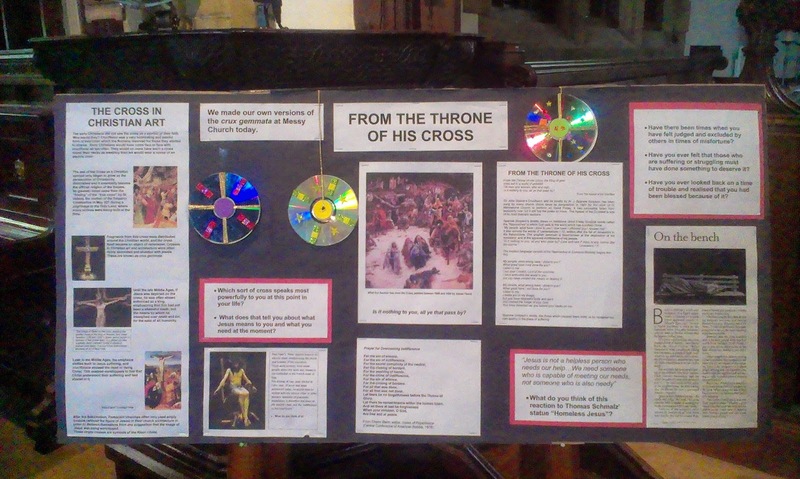 On Good Friday there will be a Messy Church session at 10 am, then the church will be set up with various focuses for self-guided reflection for you to drop in on throughout the rest of the day. From 2.30 - 3pm there will be a service of hymns, reading and prayer as we think together about the crucifixion and its meaning for us. The day will end with Compline at 8pm. On Thursday we observe Maundy Thursday with a service of Holy Communion at 8pm, followed by the service of Tenebrae, where we hear 12 readings taking us into the darkness of the night Jesus was arrested, extinguishing the candles that will light the church as we do so. On Monday, Tuesday and Wednesday there is Compline - night prayer - lasting 15 minutes or so, at 8pm in the Lady Chapel, preceded by 10 minutes of quiet music as we gather. In order to help you journey through this week, I will post the readings for our services at Seal each day above, so you can read them for yourself beforehand. You could use any of the techniques we have explored through Lent to help you contemplate them. 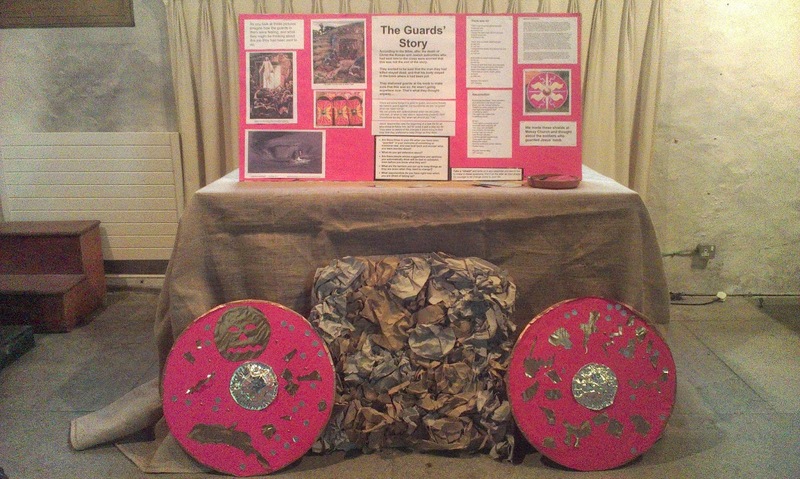 Crafts and activities to help us think about Good Friday and Easter. During the afternoon and early evening of Good Friday there will be a number of different reflective displays in church. 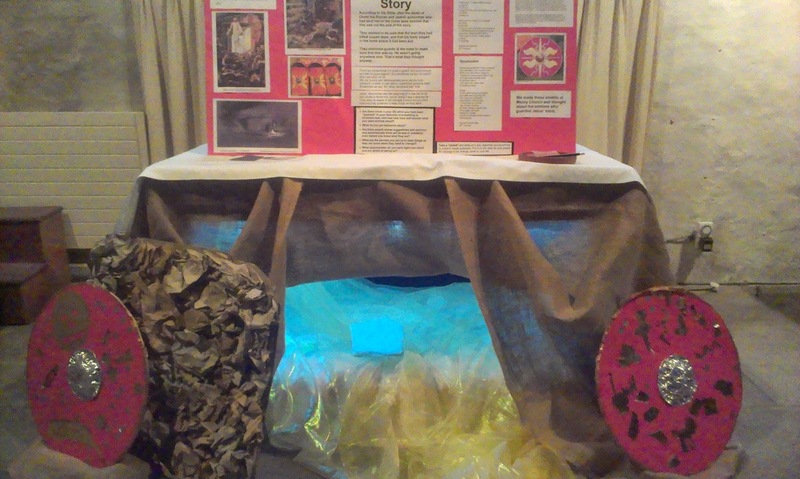 These displays encourage us to reflect and pray on various themes relevant to Holy Week and Easter. 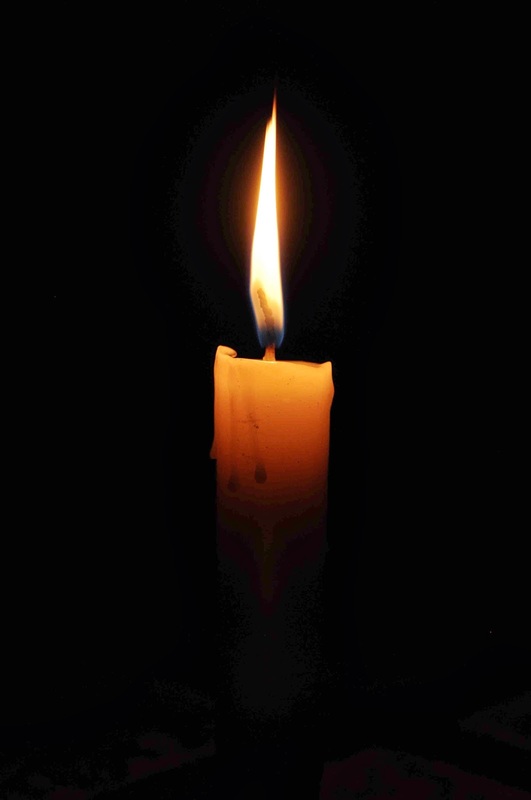 There will be quiet recorded music playing to create a reflective atmosphere. 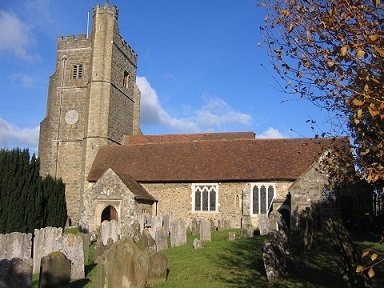 Easter Sunday was the traditional day for baptisms in the earliest days of the church, and we are delighted to be continuing that tradition as we baptise baby Susie this Easter. 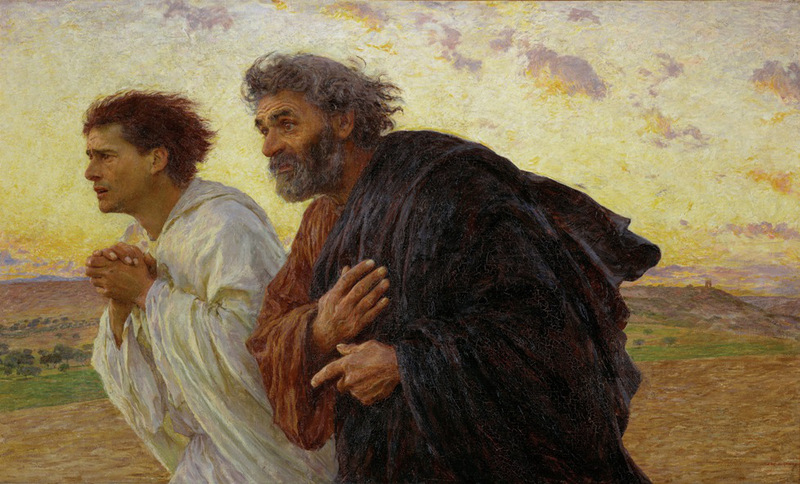 A simple service of hymns, readings and prayers exploring the Easter message. This week, I will be posting a picture for you to contemplate each day. What do I think is going on here? How are the people in it feeling? What am I drawn to or challenged by in this picture? If I could talk to the characters, what would I say and how would they respond? What do I want to say to God in response to this? Our Pilgrim Courses have just finished. 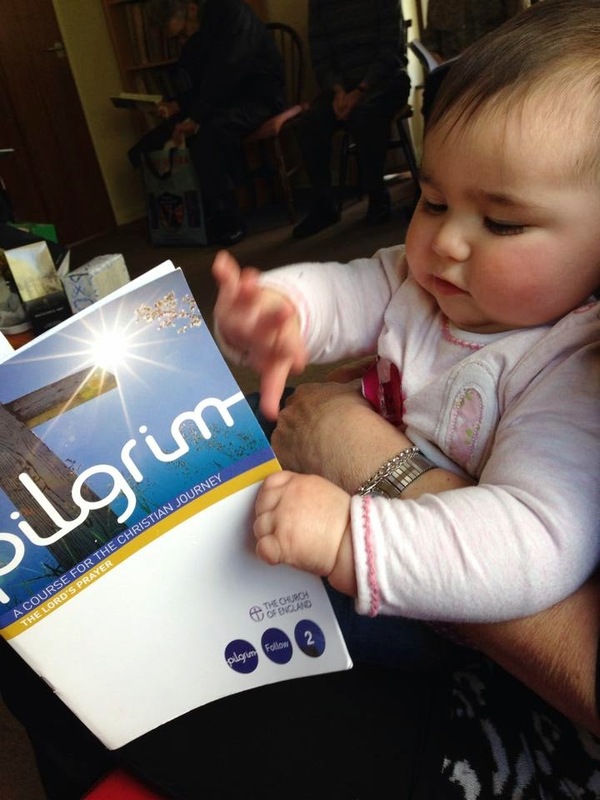 Here is a picture of our youngest Pilgrim... getting to grips with the material. She is to be baptised on Easter Sunday, so she should be very well prepared for the event! Thanks to all our (slightly older) participants, in both groups, for some very good conversations and reflections. If you'd like to keep meeting for discussion, there is the monthly Good Book Club on Wednesday mornings, and I am open to requests for an evening or weekend meeting (Good Book Club or even another Pilgrim course) if enough people want it. This week might seem like a bit of a cop-out on my part, but all I would like to suggest for this week's prayer is that you simply sit quietly and breathe in and out during your prayer time. You will probably find it helpful to begin by saying a short prayer; "God be with me" will do, as you breath in and out gently and relax your body. But then just sit still. Thoughts will rise up, but don't pursue them; just let them go as if they are clouds drifting across the sky. If you find yourself chasing after them or worrying about them, come back to your breathing again. At the end of the prayer time, thank God for being with you. 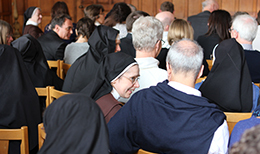 The Big Silence - BBC2 takes five volunteers to experience silence at Worth Abbey. I often come across things I wish I had written... 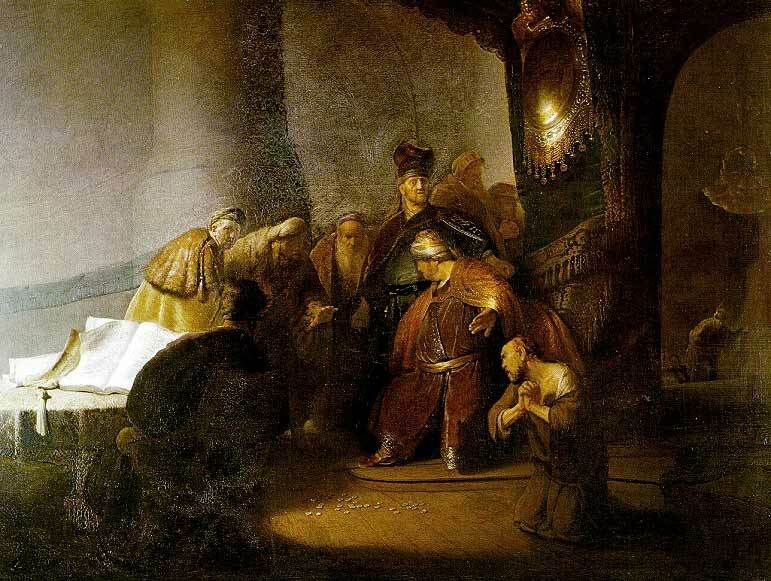 The post by Ben Myers on his blog "Faith and Theology" is definitely one of them! I it is a brilliant and powerful unpacking of the Apostles' creed, and it says everything I would want to say about it. Read the whole post on Ben's blog here.